Hey guys it’s Ash and in this post, I’m going to teach you guys everything you need to know about the Ice Golem and more! I like to describe the Ice Golem as a 2 Elixir mini-tank that targets buildings and has the ability to slow down nearby units upon death. My favorite cards in game are cheap cards that offer a lot of utility, such as the Ice Spirit and Zap. And I believe that the Ice Golem is another very important and very good utility card that will play a major role in this game. Players will be able to unlock the Ice Golem from Frozen Peak (Arena 8). The Ice Golem targets building only. He is a melee troop. Based on his Elixir cost, he has great HP but small damage. To start off, the Ice Golem is not meant to be an offensive threat. He’s one of the weakest units in the game, dealing only 28 damage per second at Level 7, even weaker than a Lava Hound. He has a slow down effect that activates after his dies. The slow down effect lasts for 3 seconds and has a radius of 2 tiles. He is a support troop that excels in defense. I’ll show you guys some key examples of how to use the Ice Golem as a defense later. But first, let’s talk about how you can utilize him on offense. You can ignore a lone Ice Golem, as he will barely do any damage by the time he reaches your tower. However, you should almost never ignore any threat behind an Ice Golem. A 4 Elixir combination with Goblins behind an Ice Golem can take down a whole Arena Tower. 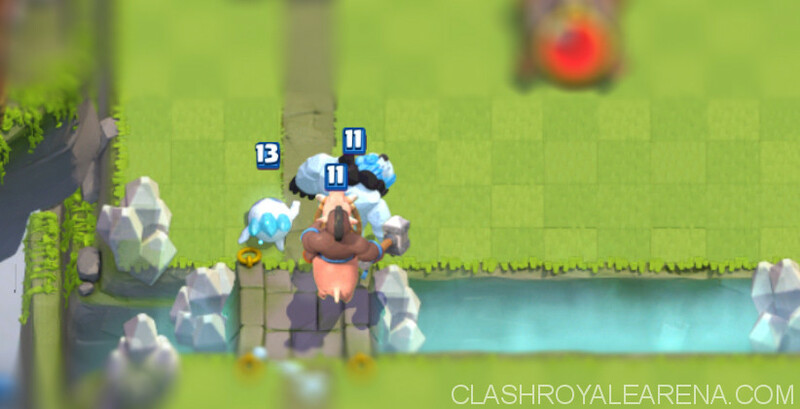 The Ice Golem is a very slow troop, but you can push him with fast troops like the Hog Rider, Prince, Dark Prince, or Goblins to make him travel faster. Another very good way to use the Ice Golem on offense is by splitting Three Musketeers. 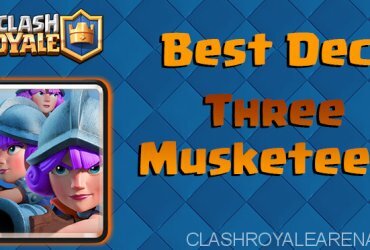 You want to split your Three Musketeers of course to prevent them all getting hit by a Fireball or Poison, and since the Ice Golem is a very cheap mini tank, you will have the Elixir to support two of your Musketeers with it, and also have enough Elixir to support your other the other Musketeer with an Ice Spirit. 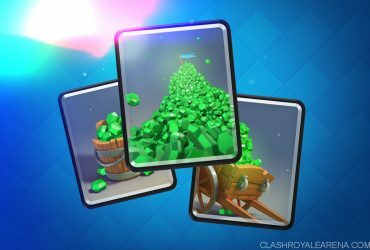 This 12 Elixir combination is more deadlier than a 12 Elixir split Three Musketeer combination with Miner or Knight. Lumberberjack and Ice Golem are also a very fun combination because the Lumberjack is of course a very fragile unit, so you can complement his speed behind an Ice Golem, pushing the Ice Golem faster. So imagine a combination of Ice Golem in front of Lumberjack, and then a slow troop like the Balloon behind them. If Ice Golem dies, he’ll slow down every unit, including the Arena Tower within his 2 tile radius. Allowing your Lumberjack to do more damage and Balloon to get to the Arena Tower quicker. And then when your Lumberjack dies, the Balloon will not only move faster, but also drop his bombs quicker. Remember, the Ice Golem isn’t very tanky, he has less hit points than a Knight, so he’s definitely no substitute for a troop like a Giant. He’s best used defensively, So let’s now talk about his huge defensive potential. His slow down effect lasts for 3 seconds, slowing them down by 35%, similar to an Ice Wizard. However, one important thing to note is that the slow down effects of Ice Golem, Ice Wizard, and Poison do not stack. A Poison Spell slows down all units by 20% within its radius. So if you have your Ice Golem inside your Poison to defend with too, then his slow down effect will slow down all units within it by 35%, which will mask the Poison Spell’s effect. Another thing to note is that he does not reset the target of units with his slow down effect. The effect will not reset the charge of Inferno Tower, Sparky, nor Inferno Dragon. And one very important thing to note is that the Ice Golem’s slow down effect will also slow down air units but it will NOT inflict any damage onto them. A Golem’s death damage also has no affect air units. The Ice Golem’s death damage will not kill any unit in the game. Not even Level 4 Skeletons from a Level 4 Skeleton Army. Ice Golem’s death damage + Poison will NOT kill Musketeers or Wizard. 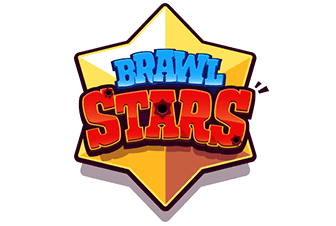 However, Fireball + Ice Golem’s death damage WILL kill Musketeers or Wizard. Ice Golem’s death damage + Poison or Fireball will NOT kill Barbarians. Now let’s talk about the Ice Golem’s best defensive attribute, and that is kiting. The Ice Golem is the best “kiter” in the entire game for his cheap 2 Elixir cost. Making super deadly on defense. Say your opponent has a troop such as the Mini Pekka, Prince, or Mega Minion behind his Giant, which most players commonly have. You can use the Ice Golem to safely kite away the Mini Pekka while you safely kill the Giant with your own Mini Pekka. Got a Prince charging onto you? Fear not, just use the Ice Golem to kite it away. By pulling the Prince to the center, both Arena Towers will target it and then the slow down effect will slow it down. The Prince won’t be able to even touch your tower! Got a Pekka coming at you? Fear not, just use the Ice Golem to kite it while using an air troop to take them down. Got Barbarians coming at you and you don’t want to waste a Fireball? Use the Ice Golem to distract them away from your weakened tower. The Ice Golem can distract and tank against Bowler long enough for your Arena Tower to kill him before he can touch your Arena Tower. The Ice Golem is an excellent cheap distraction for the Three Musketeers. You can use the Ice Golem to force a troop to retarget onto it even after that troop locked onto your Arena Tower. For example, if a Giant Skeleton is locked onto your tower, then you can force it to retarget and then distract and pull back the Giant Skeleton, saving your tower from its immense bomb damage. You can use the Ice Golem to push back and force the Princess to retarget onto it. You can push back any ranged ground attacker locked onto your tower or troop and force it to retarget onto your Ice Golem. Don’t waste your Zap to reset the target of a Royal Giant, just use your Ice Golem. So next time someone sends in a huge push like Giant Prince Mega Minion, remember to kite! Hope you guys enjoyed this, be sure to leave a like if you did. Thanks for reading and watching my video, be sure to subscribe for more daily Clash Royale content. Thank you! 23/1/2017: HP decreased by 5%, death damage radius and slow duration reduced. 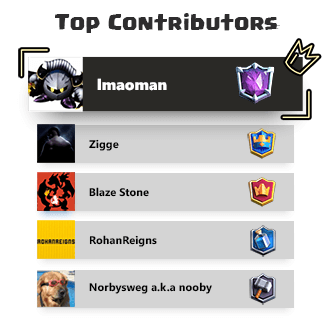 What do you think about this new card guys? How will you use him? Please share your opinions!